Exchange House has been delighted to work in partnership with five other organisations across Europe on the Compass Project, a Leonardo de Vinci Education and Culture, EU project. The Compass project worked with disadvantaged Traveller youth, national training agencies, educational institutes, employers organisations and career guidance experts to design and implement an innovative training programme that created educational and employment options for the youth that were involved. This training programme is entitled the “Urban Orienteering Race”. Following the completion of the Urban Orienteering Race, participants from the project have gone on to do training courses, apply for jobs and enrol in college. For some this is not something they could have even considered before taking part in Compass. 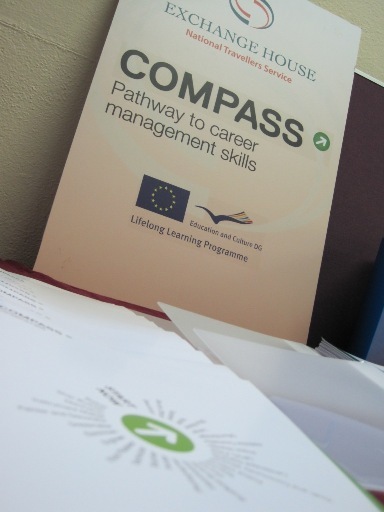 Exchange House intends to use Compass as a model to help other young Travellers as a pathway to career management skills. As part of this innovative project Exchange House National Traveller Service was the lead partner in completing a training pack designed to provide sensitisation and advice for network partners and coaches when working with Travellers and ethnic minorities. As part of the Compass project and as a celebration of the success of the project Exchange House held a final conference on the 27th September 2012. At the conference products from the project were showcased and the success of the Urban Orienteering Race was displayed.